Join us for another Wine & Words night of Live Author Readings and Spoken Word Open Mic, combined with a Steampunk Special Event! Launch Party for Kennedy J. Quinn’s New Release, The Unwitting Journeys of the Witty Miss Livingstone – Book II: Memory Key! Black Dog Art’s Cafe’, June 28th 6 to 9pm. Meet Kennedy J. Quinn and delight in delectable Fine Tea & Handmade Shortbread (while supplies last). Don’t miss this evening of fun and fabulous literature. Free Admission. Costumes encouraged but not required. Everyone Welcome! The second book in the Dawn of Steam series, DAWN OF STEAM: GODS OF THE SUN will be out soon, and the RELEASE PARTY is SATURDAY, SEPTEMBER 27th, at the AFK E&E in Renton, starting about 4 PM. This will also be Author, Jeffrey Cook’s 40th birthday, so we’re hoping some of you lovely people can come out and help him celebrate! You may remember the photos from the party for the first book, DAWN OF STEAM: FIRST LIGHT. (see one below). CLICK HERE to see all the fun. And don’t miss out on your chance to attend this next one on Sept 27th! Steampunk attire encouraged. Gifts are neither required nor expected, just looking forward to some time among friends, fans and family amidst book stuff– and to turning a nice, round number’s worth of old, or something. This step back into an alternate reality is a delight from beginning to end. The vivid characters and captivating adventure tempted me to rush through the book, but the well-rendered regency/steampunk hybrid style was so delicious that I meted out small portions to savor every word. As if crossing the wild west of America via dirigible is not enough excitement, the author has added entanglements in the Spanish threats to New Orleans and dabblings in other historical events with researched accuracy and madcap twists. I especially liked the unquenchable Sam Bowe, but each character was dear and bigger than life. I found myself missing them when, alas, I reached the last page. 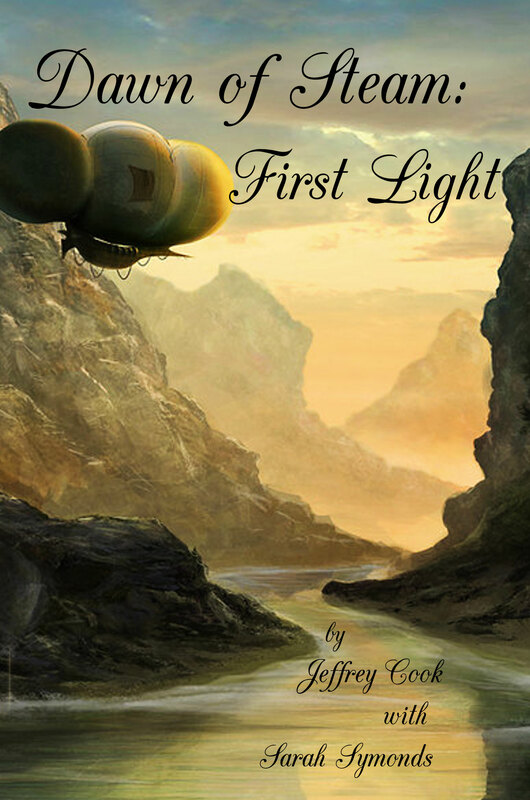 I’m thrilled that the sequel is soon on the way, and I will definitely hitch a ride on this continuing expedition! Top hats off to author Jeffrey Cook and to Sarah Symonds. This is a new favorite, and I find myself recommending it to anyone who will listen. I hope all is well down on the farm. Did you get hit by the Great Gale last week? I do hope the orchards are doing well. soon as it’s finished. I am still trying to fully reconcile myself to that. she added Port to our tea, not even just brandy. Imagine that! Pacific Coast. Perhaps New Orleans, or New York? the name of my crew every Sunday.